The Ultimate Hardwood Cheese Press! 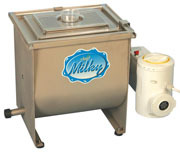 We are pleased to announce that we now offer the following Milkplan chillers/bulk tanks. Milkplan is a well-established European brand with over 25 years of tradition and experience in manufacturing milk coolers, which guarantees reliable and efficient milk cooling. 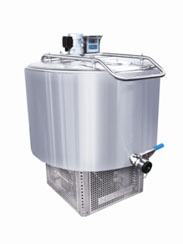 Milkplan coolers offer years of trouble-free performance, the lowest operating cost, precise temperature control, and a wide range of standard features and options. 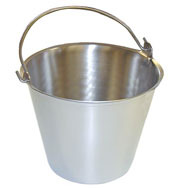 All coolers are made of stainless steel, and their ISO 9001:2000 certificates ensure high quality. 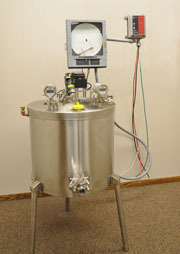 The insulated double-wall container and the quality of the Milkplan built-in components ensure low energy consumption. All Milkplan milk coolers come equipped with electronic programmers with a digital temperature display. They are free-standing, and simply plug into a standard 120 Volt 20 Amp outlet. Adjustable feet enable easy leveling. They all come equipped with agitators, essential for quick cooling, and will easily cool your milk down from 95'F to 39.2'F in less than 2 hours. The tanks must be 10% full in order to work properly (and not freeze the milk inside). 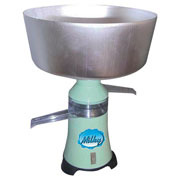 The milk temperature set point is adjustable. The "shoe box" styled lids keep your milk cool and secure. The outlet valve is a manually-cleanable butterfly valve. We guarantee full service on the tank from our skilled technicians for one year. Newly released on the market! 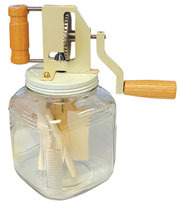 This Hardwood Cheese Press was made for home cheese makers, designed and manufactured right here in the USA! Made from a beautiful grained hard maple, with a lighter basic color with various shades of darker marbling. Hoops are made of food grade heavy duty water pipe. Professional cheese makers prefer this type of hoop over the metal hoop type, as it won't cause too fast of cooling the cheese during pressing time. Made with all food grade materials, will last a very long time, sturdy hardwood with stainless steel fasteners that are made in the USA! Finished wood with all natural 100% Tung Oil, no odor, no petro-chemicals, FDA approved for food contact... makes the wood water proof, will not turn rancid. We use real wood, not plastic.. latest research confirms that wood inhibits bacterial growth, which is not the case for plastics such as melamine. Now you know why everyone is going back to butcher block cutting boards! 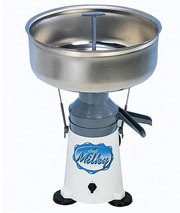 No need for gauge... as you just turn to tighten as whey is released. So Simple! Easy to Clean! Just can't say enough about this press... it's the best! Please note: Tung oil is a nut oil and those with nut allergies may be sensitive. Please contact us if you want our cheese press but need one without Tung Oil and are willing to have one with a finish used for making butcher blocks.